ROSEMONT, Ill. – Cassius Winston scored 17 points, and No. 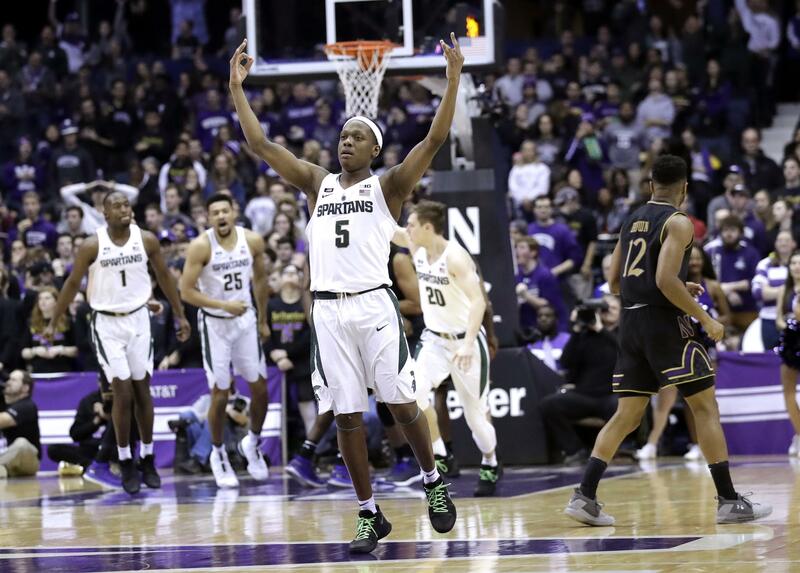 2 Michigan State erased a 27-point deficit on Saturday to beat Northwestern 65-60 and extend its winning streak to 10 games. They led by as much as 27 and were up 49-27 after a stunning first half that had fans chanting “Overrated!” But the Spartans outscored the Wildcats 29-4 over the first 14 1/2 minutes of the second half. CINCINNATI – Mikal Bridges led an early 3-point shooting spurt that put Villanova in control, and the Wildcats showed they’re not ready to relinquish their reign in the Big East, beating Xavier in a showdown for the league lead. The Wildcats (24-3, 11-3) have won all four regular-season titles since the league was reconfigured. Xavier (24-4, 12-3) had a chance to take control of the race, but simply wasn’t up to the Wildcats’ level in the biggest game of the season. Now, Xavier’s lead is down to a half game and Villanova has swept the season series. Bridges scored 25 points in a balanced attack that got the best of a matchup between the league’s top offenses. Trevon Bluiett had 26 points for Xavier, which had its nine-game winning streak snapped. The Wildcats ended their three-game shooting slump by making 11 3-pointers in the first half when they pulled out to a 19-point lead and silenced a raucous crowd at the Cintas Center, where Xavier was undefeated this season. WACO, Texas – Terry Maston scored 24 points, and Baylor ended the Red Raiders’ seven-game winning streak after the Big 12 leaders lost top scorer Keenan Evans to a foot injury in the first half. Baylor moved into sole possession of fifth place, and Texas Tech (22-5, 10-4) dropped into a tie for first with No. 13 Kansas. Freshman Zhaire Smith led the Red Raiders with 15 points, but had just two points and attempted just two shots after halftime. Evans, the No. 2 scorer in the Big 12 behind Oklahoma freshman sensation Trae Young, limped off with 1:14 left in the first half and didn’t return. SPOKANE – Johnathan Williams had 18 points and 12 rebounds and Gonzaga held off last-place Pepperdine to remain in first place in the West Coast Conference. Killian Tillie and Josh Perkins each scored 15 points for Gonzaga (25-4, 15-1 WCC), which has won nine consecutive games since suffering its only league loss to No. 15 Saint Mary’s. Colbey Ross scored 21 points for Pepperdine (4-24, 1-15), which has lost seven straight. Gonzaga has won 35 straight games against Pepperdine dating to 2002. The Waves have not won in Spokane since 1998. COLUMBIA, S.C. – Frank Booker scored 19 points, and South Carolina built a 26-point lead before holding on to defeat Auburn, ending the Gamecocks’ six-game losing streak. The Tigers (23-4, 11-3 Southeastern Conference) had won seven of their past eight and were heavy favorites to keep that going at South Carolina (14-13, 5-9). Instead, the Gamecocks used a 21-1 run in the first half on the way to a 37-11 lead. Auburn played most of the game without starting forward Anfernee McLemore, who dislocated his left ankle in a gruesome-looking injury at the end of the first half. South Carolina beat a top-10 program for the third straight season and defeated its first top-10 team at home since taking out No. 1 Kentucky in January 2010. Mustapha Heron led Auburn with 16 points, just four of those coming in the second half. LAWRENCE, Kan. – Udoka Azubuike scored 21 points and Devonte’ Graham added 15 to help Kansas past West Virginia. Both teams struggled to create much separation in the first half, neither establishing more than a six-point lead. After being tied at halftime, the Mountaineers (19-8, 8-6 Big 12) took the lead with 17:22 left and held it until the game was tied again at 66 with about two minutes remaining. The Jayhawks (20-7, 10-4 Big 12) wouldn’t reclaim the lead until Svi Mykhailiuk hit a pair of free throws 30 seconds later. Daxter Miles Jr. led West Virginia with 22 points and hit 6-of-9 shots from behind the arc. Jevon Carter added 15 points, seven assists and six rebounds. The Mountaineers had previously won 74 of their last 76 games when holding opponents to 69 points or less. LOUISVILLE, Ky. – Joel Berry scored 23 points, Luke Maye had 13 rebounds and North Carolina dominated the boards and second-chance points against Louisville for its fifth consecutive victory. The Tar Heels (21-7, 10-5 Atlantic Coast Conference) scored 10 straight points for a 12-3 lead before warming up from long range to eventually build a 19-point cushion before withstanding several Louisville rallies. Theo Pinson and Maye each had 19 points as North Carolina won its first visit to Louisville in five tries. Louisville (18-9, 8-6) got within single digits several times but no closer than seven in having its two-game winning streak end. Deng Adel returned from a two-game absence with an ankle injury to score 20 points. PORTLAND, Ore. – Jock Landale had 23 points and 10 rebounds and Saint Mary’s rebounded from a pair of losses to beat Portland. Tanner Krebs added 16 points for the Gaels (25-4, 14-2 West Coast Conference), who have won seven straight against the Pilots (10-19, 4-12). With the victory, Saint Mary’s has its third straight 25-win season. Marcus Shaver Jr. had 15 points for Portland, which has dropped four straight games. The Gaels sit in second in the West Coast Conference standings behind Gonzaga with just two more games to go. The conference championship tournament is set to start March 1 in Las Vegas. ATHENS, Ga. – Yante Maten scored 19 points, and Georgia denied the Volunteers an opportunity to pull within a game of the SEC lead. Derek Ogbeide had 16 points and 11 rebounds and Georgia (15-11, 6-8 Southeastern Conference) won its second straight in a late attempt to return to NCAA Tournament consideration. Tennessee (19-7, 9-5) remained two games behind No. 10 Auburn, the SEC leader. The Vols have lost two of their last three. Lamonte Turner led Tennessee with 14 points. Jordan Bowden had 13, and Admiral Schofield scored 11. FAYETTEVILLE, Ark. – Jaylen Barford scored 14 of his 21 points in the second half to lead Arkansas to its fourth straight win. Robert Williams had 20 points and 14 rebounds to lead Texas A&M (17-10, 6-8), which lost its second straight after entering the rankings this week. Admon Gilder also scored 20 points for the Aggies. NORMAN, Okla. – Dylan Osetkowski scored 21 points, Texas slowed national scoring leader Trae Young, and the Longhorns extended the Sooners’ losing streak to five games. Young, a freshman point guard, scored 26 points on 7 for 21 shooting. Christian James scored 11 points and was the only other Sooner to score in double figures. Kerwin Roach scored 12 points, Matt Coleman scored 11 and Mohamed Bamba added 10 points and 18 rebounds for Texas (16-11, 6-8 Big 12), which never trailed and swept the season series for the first time since 2011-12. The Longhorns, who had lost three straight, got a much-needed win to boost their NCAA Tournament hopes. The Sooners (16-10, 6-8) shot just 30.8 percent overall and posted their lowest-scoring game of the season. LOGAN, Utah (AP) – Cody Martin scored 30 points on 13-of-18 shooting and twin brother Caleb Martin added 23 points to lead Nevada past Utah State. Jordan Caroline chipped in with 20 points for the Wolf Pack. Nevada (23-5, 11-2 Mountain West) shot 59.3 percent from the field – including 11-of-21 from 3-point range – to pull away from the Aggies. Koby McEwen scored 32 points and Sam Merrill added 16 to lead Utah State. The Aggies (14-14, 7-8) have lost 14 straight to ranked opponents and fell to the Wolf Pack at home for the second time in five games. Published: Feb. 17, 2018, 9:52 p.m.